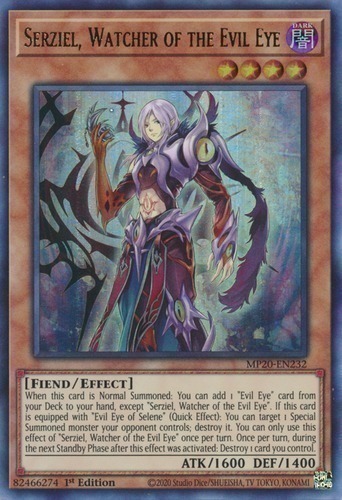 When this card is Normal Summoned: You can add 1 "Evil Eye" card from your Deck to your hand, except "Serziel, Watcher of the Evil Eye". If this card is equipped with "Evil Eye of Selene" (Quick Effect): You can target 1 Special Summoned monster your opponent controls; destroy it. You can only use this effect of "Serziel, Watcher of the Evil Eye" once per turn. Once per turn, during the next Standby Phase after this effect was activated: Destroy 1 card you control.